ABSTRACT: A simulation of a simple penetration experiment is performed using Material Point Method (MPM) through the Uintah Computational Framework (UCF) and interpreted using the post-processing visualization program VisIt. MPM formatting sets a background mesh with explicit boundaries and monitors the interaction of particles within that mesh to predict the varying movements and orientations of a material in response to loads. 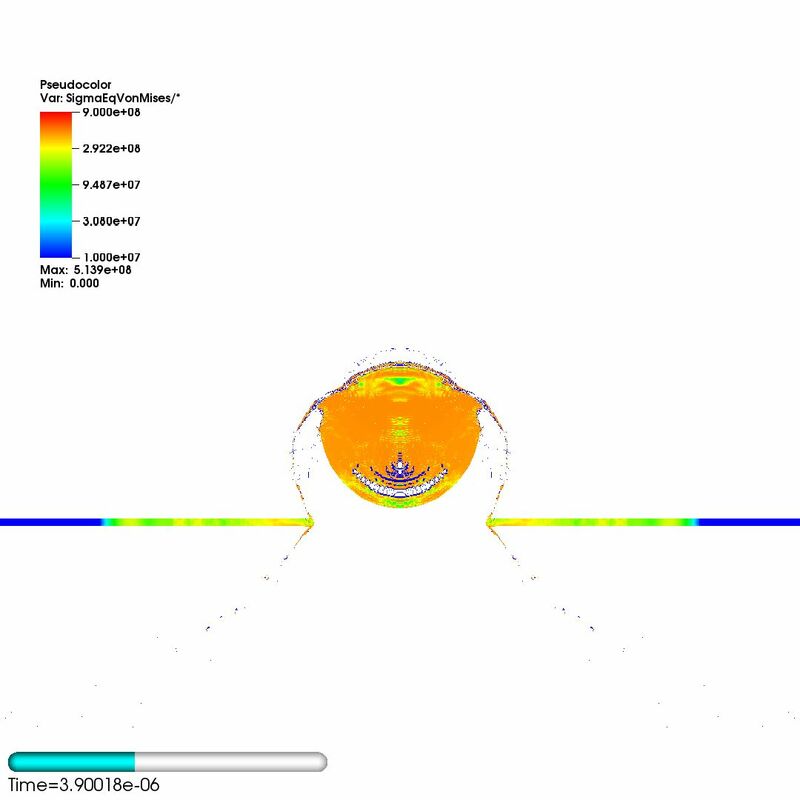 The modeled experiment compares the effects of an aluminum sphere impacting an aluminum sheet at varying velocities. In this work, the experiment called launch T-1428 (by Piekutowski and Poorman) is simulated using UCF and VisIt. The two materials in the experiment are both simulated using a hypoelastic-plastic model. Varying grid resolutions were used to verify the convergent behavior of the simulations to the experimental results. The validity of the simulation is quantified by comparing perforation hole diameter. A full 3-D simulation followed and was also compared to experimental results. Results and issues in both 2-D and 3-D simulation efforts are discussed. Both the axisymmetric and 3-D simulation results provided very good data with clear convergent behavior. This entry was posted in Abstracts, Projects, Research, Validation, Verification and tagged experiment, Material Point Method, MPM, Perforation, Physics, simulation, Uintah, Verification and Validation. Bookmark the permalink.